On 10 February (my son's 5th birthday! 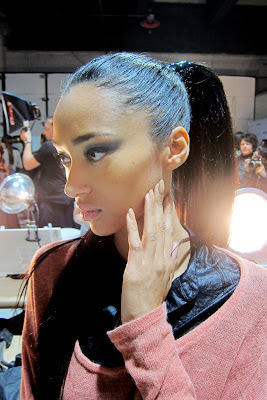 ), OPI was out in full force for the Jason Wu and Rebecca Taylor shows. Oddly enough, 10 February was also the anniversary of Rebecca Black's "Friday" song debuting. Hah. Please enjoy the following release from OPI. All images are courtesy of OPI. OPI was used on nails for the Jason Wu and Rebecca Taylor fall/winter shows at St. John’s Center Studios and Lincoln Center! For Jason Wu, models’ nails were painted with taupe hue, San Tan-tonio. The noticeable neutral complimented clothes in taupe, black and gold with pops of fuchsia and red. Meanwhile, Road House Blues, a purple-y navy, was painted on models’ nails for Rebecca Taylor to compliment the collection’s dark colors and floral prints. Celeb attendees of Jason Wu included Shailene Woodley (actress, The Descendants), while Rebecca Taylor’s front row seated Olivia Palermo and Zoe Kravitz.